Police Officer James Yeager will be fired after a viral video caught him violently slamming a handcuffed suspect last month. 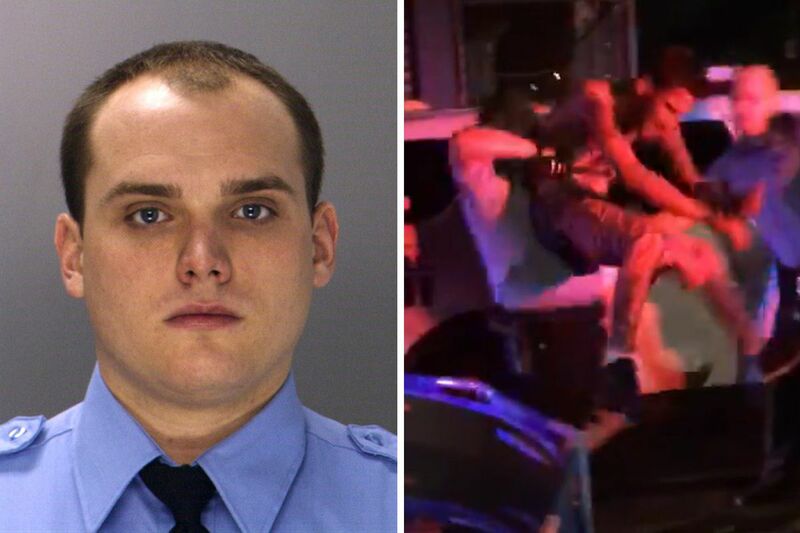 The Philadelphia police officer who was videorecorded in July picking up a man and slamming him head-first into the side of an above-ground swimming pool in Kensington, critically injuring him, has been suspended and his employment will be terminated, the Police Department announced Friday. Officer James Yeager, 26, a four-year veteran of the force, surrendered to the Police Department's Internal Affairs Unit as a result of the investigation into the chaotic July 10 incident. Police Commissioner Richard Ross suspended Yeager for 30 days with the intent to dismiss at the end of the 30 days, according to a department statement. "About 12:20 a.m., officers attempted to arrest a 21-year-old male on the 200 block of East Elkhart Street for narcotics. The male was actively resisting arrest by swinging his arms and kicking. Cellphone video footage of the incident was obtained and forwarded to the Office of Public Affairs. The footage depicted Officer James Yeager in full uniform grabbing the male after he was handcuffed and forcibly slamming him to the ground; in addition the video shows Officer Yeager place his ASP around the male's chest, picking him up and swinging him around causing the male to strike his head against the side of a pool. The male was subsequently taken to Temple hospital in critical condition." Ariel Rivera, 24, who recorded and posted the video on Facebook, said she was pleased Yeager was being held accountable for his actions. "The officers have families to support, but it doesn't give them the right to treat people like animals. The way they treated him was totally unnecessary," she said, referring to Kevin Rovila, 21. She said he is homeless and sleeps on a mattress another neighbor placed on the sidewalk for him.While the video has been seen more than 500,000 times on her Facebook page, garnering many angry comments directed at the police, Rivera said she did not believe Yeager should be fired. "To be honest, what I think he should do is give a public apology and he should acknowledge that what he did was wrong. If he … stays on the force he should do what his job calls for him to do, not what he wants to do."